The Tri-Star allows for integration of all of your ventilation components for complete control over your barn environment. The Tri-Star is an expert dairy control that offers many options for controlling your barn ventilation in 1 easy to use package! 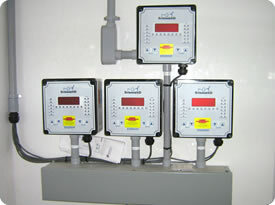 Sun-North Shepherd controls are state of the art electronic controls which are able to monitor many different regions of your animal facility. Shepherd controls will adjust individual sidewall panels and ridge outlets over the entirety of your building taking into account inside temperature and outside weather conditions and adjusting for swings in wind and rain directions. All livestock buildings create micro climates (very noticeable areas of temperature differences). Shepherd controls will monitor and adjust for these areas of temperature difference. Natural ventilation can save 65% of your energy cost (compared to all power and mechanical ventilation). Shepherd electronic controls will link to supplementary heating, cooling and humidity equipment and adjust accordingly.